An Incentive Package that Works! Almost a year ago Jim Carter wanted to increase week night business at The Perfect Landing restaurant located at Centennial Airport. In celebration of their 10th anniversary he offered a half-dozen items for $10. As diners heard of this incentive the restaurant filled almost every Tuesday, Wednesday and Thursday evenings. Reservations became a necessity. Carter kept the $10 specials – the best dining value in the Denver metro area. Each entree is served with the chef’s choice of a starch and vegetable. Plus, warm Perfect Landing bread served with herb butter. Baked in-house the bread is perfect with a crusty exterior and soft, flavorful interior. We always leave the bread basket empty and have even been known to request a couple more slices. We’ve become regular devotees. Bob almost always selects the salmon, ordering it rare as chef Sean Carter suggests, perfectly glazed. 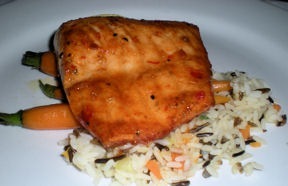 On our latest visit the salmon was accompanied by rice pilaf and glazed baby carrots. 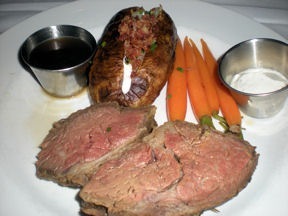 I’m a fan of the boneless prime rib dinner, served last night with a baked potato and the carrots. We usually split a salad, either the Traditional Caesar or the Perfect Salad of mixed greens, craisins, pecans and bleu cheese crumbles with an orange balsamic vinaigrette. Although we’re not fans, many patrons prefer the Grilled Caesar. Not wanting to witness disappointment Bob always reserves a slice of the key lime pie when we place our entree order. 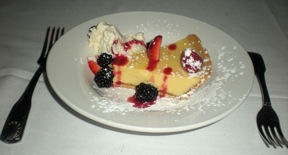 I’ve sampled key lime pie from coast to coast and award Perfect Landing my “Best Ever” award. Made in-house, they achieve the “perfect” balance of sweet and tart. What a treat! The dining room overlooks Centennial airport’s runways and the western horizon – a panoramic mountain view from Pikes Peak to Rocky Mountain National Park. We’re entertained watching helicopters come in for a quick refueling and planes, from small two-seaters to corporate jets, land and take-off. There seems to be more action on the field if we have an early reservation. With perfect timing the sun sinks below the mountains as we sa vor our dessert, capping the evening with a Technicolor light show. A long time Denver favorite, “Boogie” Bob Olsen entertains at the piano bar Tuesdays – Saturdays, 5:30-9pm. We enjoy listening and watching his happy following. At the cocktail bar and in the piano lounge area $5 appetizers are available from 5-7pm . Friday and Saturday nights lobster lovers find a whole steamed Maine lobster served with fried corn on the cob, potatoes and fresh vegetables for $20. Or, make it a Surf and Turf by adding a 6oz. center-cut filet for an additional $5. I admire the Carters for finding a way to increase business in a down economy, keeping their excellent serving staff employed and offering patrons real value for a quality meal and dining experience. We never just order the $10 dinner because we choose to add drinks, salad and dessert but still feel we’ve had a lovely evening at an affordable price. We’ve also returned for breakfasts and lunches. Perhaps the Carters could give Washington some incentive ideas. Put it on your radar, make reservations and drive or fly in for a Perfect Landing. When You Go: The Perfect Landing opens for breakfast and lunch seven days a week, open for dinner Tuesdays through Saturdays. Sorry to disappoint you, but neither their bread or their pies are made “in house”. If you like the bread, check with Blue Point Bakery. Can’t reacll where the pie is made, but not in the restaurant. Give Sean Carter credit for pretty much everything else. He has a great kitchen staff and their food is always good.